Edited 1 time(s). Last edit at 20/05/2017 11:03 by Grockle. Hildreth and Trego poor again sadly and some poor bowling and fielding but hey ho twas a good chase and you can't win em all - have to agree with AG though and the missing man was critical in my view - for a ..........? I have only just realised that the two winners of the leagues go straight to the semi-finals where they play, at home, against the winners of the two quarter-finals which comprise the second and third teams in the leagues. Okay, okay, so you all already knew that. Even more important to win our league. Really disappointed with our batting today. With the ball, generally speaking, I felt we were pretty tight & kept the score within reasonable bounds. Aside from TG's first over, which resembled a mini Boswellesque episode, (has he ever bowled a ten ball, four wide over before ? ), we stuck at our task, even if our fielding was at times, a bit scrappy. After JM's superb onslaught (granted he should have been caught before scoring), we were in an excellent position, and even after he departed, at 15 overs, we had rattled up 121 - 3 at over 8 an over, entailing a residual r/r of only about 6. Therafter, we simply didn't show the urgency or discipline needed to complete the task. Jim top scored with 77, but i.m.h.o. was as much to blame as the others as he meandered along. Overs 16-25 yielded a paltry 36 runs. How many singles did we turn into two's, two's into three's etc. ? We also seemed to go for an age without a boundary at times. All it did was build scoreboard pressure against us, leading to the run rate escalating to the stage where we just pretty much gave up the game as lost. For the second consecutive home innings, we concluded our effort way ahead of our allocated overs, with with nearly seven still remaining, which speaks for itself. Praise where praise is due & we have turned in some superb perfomances in this competition to date. But today certainly wasn't one of them. P.S. We really need Pete,James & Mr D. Senior to get their heads on straight as we move forwards (hopefully) in this tournament. James in particular, is a genius when his mind is in the right place. If only it would stay there for a little longer. Edited 2 time(s). Last edit at 14/05/2017 20:24 by Grizzzly. 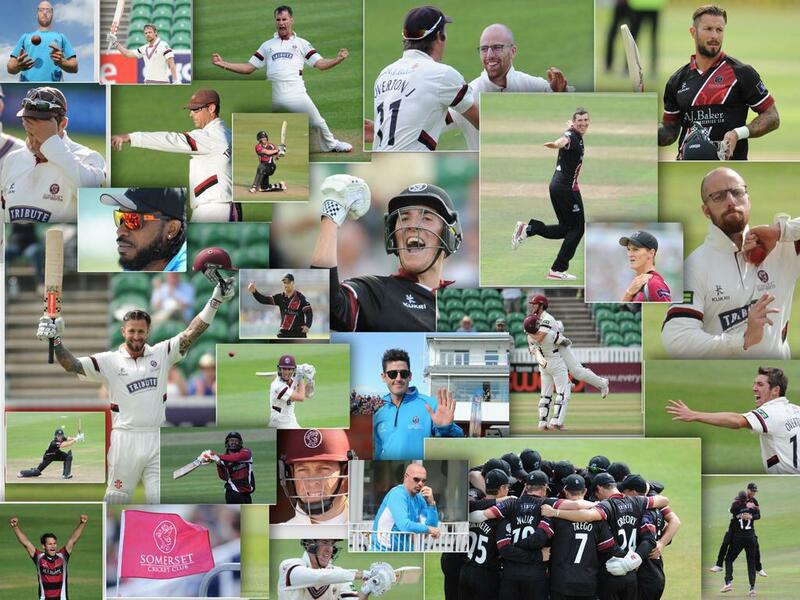 You got the feeling it wasn`t going to be Somerset`s day when Tim Groenewald, who bowled a maiden to the formidable Michael Klinger in the opening over at Bristol on Friday (twice beating the bat),started today with four wides in his first six balls. A pity about the result, the result wasn't helped by some of the fielding, Peter Trego didn't have a good day in the field or with the bat, and James Hildreth let us down with the bat. I thought the bowling was good enough and an umpire giving wides in the first over when some of the ball didn't look wide. we can't expect Adam Hose to do it every match, he looked like he might until he was bowled by Simon Harmer. James Hildreth is going through a bad time not help by the bad choice of shot, angled bat caught behind by James Foster off the bowling of Ryan ten Doeschata. I was glad to see Steve Davies get some runs but he still needs to select when to play the big shot, how he managed to get bowled playing this shot goodness knows, with Steve covering most of the stumps Simon Harmer still managed to clip the bail off. 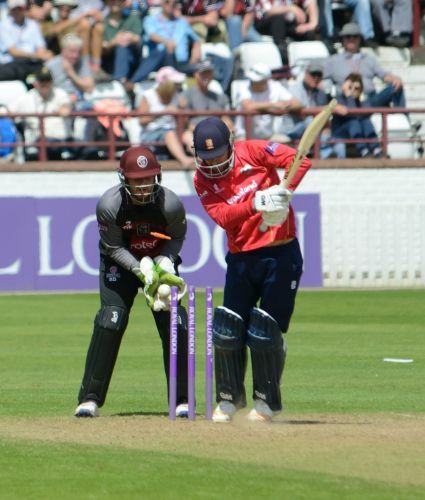 Johann Myburgh did what was required at the start of the innings, nobody could complain how he was out after giving us such a good start, this photo is a six hit by JM. Ryan ten Doeschata bowled by Roelof van der Merwe. Tom Westley also bowled by Roelof van der Merwe. Alastair Cook caught by Steve Davies bowled by Jamie Overton. A bit of surprise seeing Jim Allenby bowl after not seeing him bowl much in the fifty over games. Alastair Cook edge a ball from Jim Allenby that didn't carry to Peter Trego. The forecast for Marylebone on Wednesday is currently fairly dire. Forecast does look bad, does 2nd place mean a home q/f? On the bright side, we are now guaranteed a quarter final place, and it would take a big nrr swing to deny us a home fixture, as it stands against Notts. Course we could still go straight to the semi! Away semi then 3 or 4 days later. Not much time to plan for that. Yes and I won't be there to jinx the whole thing unless it happens after the 10th of June. I'm stopping off in Taunton for the Yorkshire game...if we come second then the semi final is the next day.Shall I stay another day? A mediocre display in all departments by Somerset yesterday. What more can one say? Well one could. Whatever was there for us to win 5 games so far in this comp. wasn't there yesterday. Hildreth and one or two others need to step up to the plate because our batting is too suspect and inconsistent, and our bowling likewise. 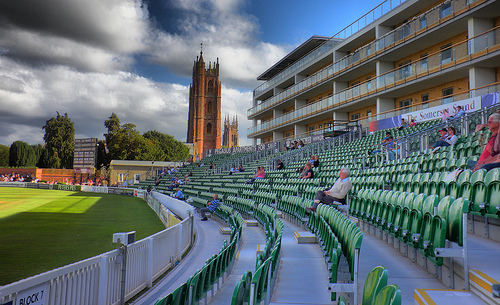 Playing on featherbeds at Taunton every game puts pressure on us. Our bowlers get hammered and batters can't summon resources to work for a big individual score every time, so its all a bit hit and miss. That's my 50 over cricket finished for another year, I shan't watch any more. I suggest you stay until 28th September, our last day at Taunton this year, and I hope to catch up with you at some time while you are there. Yep Tom absolutely mediocre batting from Johann and Max Waller was the epitome of the term with the ball. Good call sir... stay away and save yourself from these very poor displays. A bad result makes everyone mediocre but a good result s usually assessed as only the result of one single player performance... weird that isn't it? You clearly don't understand the difference in the meaning of the words mediocre and bad. What I witnessed was mediocre and the reason that we lost the game by a distance..
Maybe you have been burying your head for too long in those sand dunes that you are heading back to. Good luck with that. Oh I clearly do Tom. I also understand and completely agree with your decision to stay away. I could mention a number of promising and decent things that happened yesterday in a poor result but what would be the point? You can't see any wood for all those mediocre trees. There was good bad and mediocre. The result was a mix of the three. But when you classify everything as 50 shades of dark I suppose its a problem to stay motivated. Never mind aye? We'll watch and report for you and you can pick out the gloomier bits. Edited 1 time(s). Last edit at 15/05/2017 18:37 by Grockle. Mybs certainly a huge plus especially because, IMO, he is likely to be needed upon the resumption of red-ball cricket. Hose has also been a big plus in this campaign and, with Elgar unavailable and Abell, arguably, unpickable (I'm told that he added another club cricket failure at the weekend) then AH may also be needed vs Warks. I could mention a number of promising and decent things that happened yesterday in a poor result but what would be the point? As I was there, there is no point because the point is we lost. Or haven't your tinted glasses made you aware of that? Tom Abell's form even in the Second XI is very worrying, and as it has been identified that he is suffering from the effects of some unwise coaching whilst in Australia this past Winter, I feel that it would be very unwise (both for his sake as well as for the club's) to select him immediately for the Firsts. If those at the club should realise this, and I very much doubt that they will, they should not try to explain his absence being as the result of a 'mystery injury'. I would rather they were honest enough to say that he is in need of needing to work on his game in order to get it back to where it should be. If so, Trego for stand in captain. Surely the Management MUST protect Tom . He is a wonderful talent who, for the moment has lost his way battingwise, and needs to be taken out of the firing line until he recovers his confidence. I'm afraid that if he is persisted with next match he may find it very difficult to recover if he fails again. I would like him to be given time to recover his skills and for the next couple of seasons really establish himself as an automatic choice as a top order batsman, and perhaps looking at regaining the captaincy after that. I agree Clarence - if he will take it, give it to Peter. He has had 2 matches. 4 innings. One dismissal was a nick down legside. Of course he needs runs soon but its crazy to be dropping our captain after just 2 poor matches. If he was the right choice in December surely he deserves more than 2 matches. Everyone entitled to their opinion, the above is mine. I have no intetest in debating it. If he scores runs Friday i'll be well pleased for him. To even be questioning him after 2 games makes no sense to me. People seem increasingly short term these days. We have 4 champo games in a row now, if after those things havent improved yes maybe a call to revisit things but 2 games for me isnt enough to write him off. And to pre-empt, pre season nor 2nd team matter a jot, nice if you get runs but champo runs the only currency that matters. Finally i think his captaincy has been unquestionable so far, a score with the bat Friday and all sorted! Agree with WSM fan the management will persevere with Tom for a while yet otherwise their decision to give him the captaincy in the first place will be questioned. For what it's worth I think his captaincy has been fine so far. To question him 2 games in is ridiculous. Of course he needs runs asap, but as do most of our top order in Championship excluding Elgar. Second innings batting in both championship matches is what has cost us. More application and discipline required by all the batters if we are to improve on our poor start. Unfortunately, too many jump on the bandwagon and expect instant results a bit like the current football fan. Let's reassess after next 4 championship games. Nothing will please me more than Tom hitting a ton on Friday to silence the doubters! Sorry to change the subject back but here is my take on the Essex 50 over match. Somerset came up against the prevailing wind on Sunday. Not the one from the West that usually governs these parts and leaves the trunk of the small tree in my front garden with a permanent Eastward list. In this match the stronger wind blew from the East, all the way from Essex, with a powerful unceasing force. Somerset stood hard against it at times but somehow did not seem to be quite on top of their game and, in the end, were blown away. 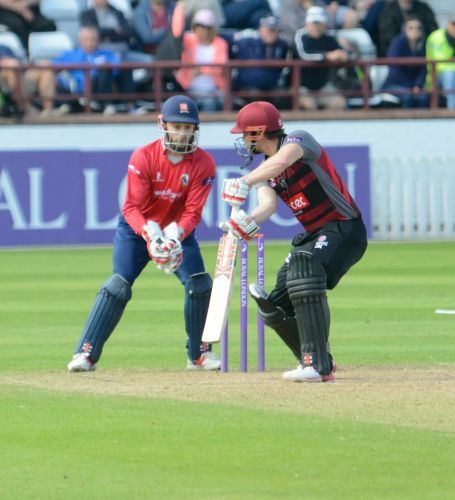 Essex played with unremitting force throughout and it will take a team capable of applying greater force throughout, and it will have to be throughout, a game to overcome them in this competition. 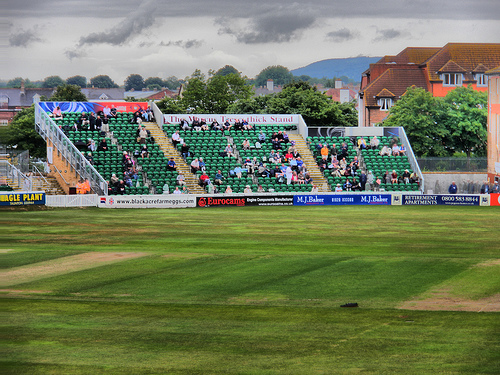 How Glamorgan managed to beat them, for no-one else has, is a mystery. It seemed at the time as if Essex folded under the pressure of the chase. It seems unlikely they will allow that to happen again. And they may have come back even stronger. 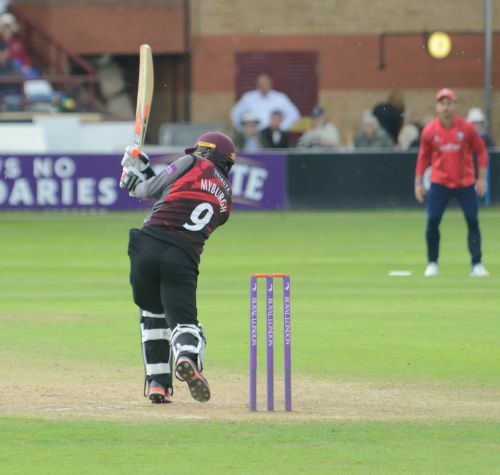 Middlesex were despatched by 7 wickets in the next game and, in the end, Somerset wilted in the gale yesterday. After a near faultless fielding performance at Bristol Somerset were, to a startled crowd not used to profligacy in the field, well off the pace at the start of the Essex innings. In the first dozen or so overs the ball went through hands as if it was coated in the best organic butter more times than I suspect it has all season. It perhaps gifted Essex twenty or so runs. There had been a lot of overnight rain. Perhaps the ball came off the grass a little greasy but if it did there was not enough getting the body behind the ball in the old-fashioned way. Whatever the reason, and it may have nothing to do with a greasy ball, it cost Somerset dear. Tim Groenewald’s, I imagine unprecedented for him, four wides in the first over and 26 runs off his first three added to Essex’s advantage. 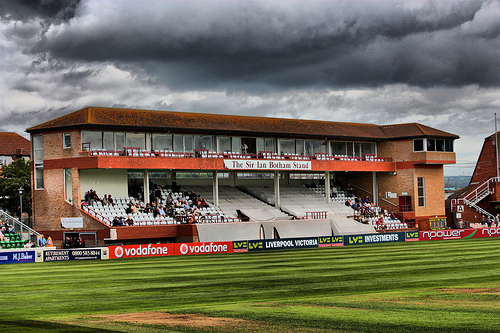 Unless they expected some early life, which did not materialise, Somerset must have expected to chase upwards of 300 on this flattest of pitches when they chose to field. At the end of the twelfth over Essex had breezed along to 79-1, the immediate pressure was off, and the straws in the wind were of a total upwards of 350. A pity when a good ball from Craig Overton, had pinned Chopra early. In the next 10 overs 61 more were added mainly against some Somerset persistence from Waller and Allenby and a fast improving fielding performance. Only three fours and a six as Essex minimised risk. In current 50 over cricket 6 an over is not storming along but with the pressure taken off from the start Essex were perhaps freed up to push an extra run an over above the norm for this stage of an innings in spite of Somerset’s improving fielding and bowling. 140-1 from 22 with the modern rule of thumb to estimate a 50 over total with wickets in hand being to double the 30 over score. 380 was the darkening storm cloud threatening Somerset’s horizon. Enter Jamie Overton after another 11 runs in the 23rd over to bowl with pace and control to tempt Cook to waft a wide fast last ball through to Davies. Cook 65. Essex 156-2. Now Somerset really put their faces into the wind and the bowlers, van de Merwe, both Overtons, a returning and more familiarly accurate Groenewald and the fielders, now fully back on song, started to constrain Essex. 12 overs for 55 runs with only three boundaries. 182-2 in the 30th. 209-2 in the 36th. A spirited comeback by Somerset but a tremendous base for the final assault although not quite in range of the huge total that might have been. Somerset’s application of pressure after the fall of Cook eventually told. 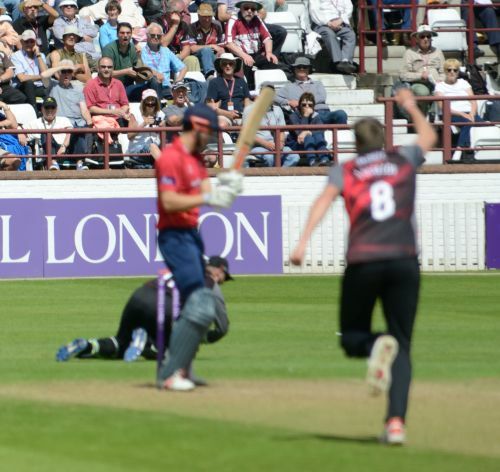 Van de Merwe bowled Westley for 100 and ten Doeschate for 3 in successive overs. 215-4 in the 38th. The game, if not exactly back in the balance, was less uneven than it had been. Essex though steadied themselves, perhaps remembering Cardiff, and responded to pressure with pressure in the form of Bopara and Zaidi. 39 runs in the first 5 overs of their partnership and 42 in the second 4. 297-4 off 47. Somerset still clung on and two wickets in the 48th, Zaidi to a stunning, swooping Walleresque boundary catch from Hose and Foster to a sharp run out momentarily raised hopes of finally slowing the Essex charge. Perhaps they might be held to 320. Then the West Country prevailing wind blew in a shower from over the flats and delayed play for 15 minutes. Somerset bowl their overs at such a speed these days that there was time for Essex to regroup and for the final two overs before the cut off time from which they hit 27. 334-6. Perhaps 40 less than Essex might have hoped for before Cook was out and perhaps 40 more than Somerset would have hoped for when they put them in. Somerset showed no signs of being cowed. They started their innings by puncturing the unrelenting Essex storm with a tornado of their own. Johannes Myburg, the almost forgotten man among Somerset’s batsmen, having popped one straight to mid-on in the first over and being inexplicably dropped by Walter, suddenly let loose a flashing bat with such speed, ferocity and frequency that, had it had a sharp edge, it could have cleared Essex of more trees than the Great Storm of 1987. Eventually and inevitably he miss-hit a vicious pull which climbed steeply towards and way above the height of the flats. Even so he might just have survived with another 6 had the ball not been hit full in the face by that home wind which roared from over the flats. As it was, the ball fell away to Chopra three or four yards inside the boundary. 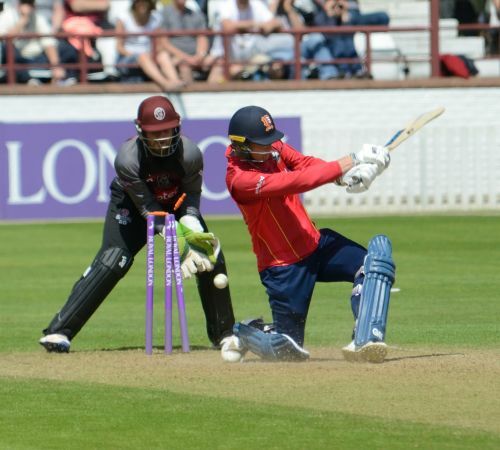 Myburg had hit six 4s, four 6s and 57 in total from the last 23 balls of his innings having hit none off the first 5. 64-1 in 6.3 overs, the original required rate of 6.7 reduced to 6.2 and the target from 335 to 272. Myburg had undone the damage of the first dozen overs of the match. Now, the two teams were eye ball to eye ball, both in with a chance. Somerset needed 6.2 an over. Over the next 15 overs they kept going, face to that persevering Essex wind, scoring at 5.5 an over in the face of tight bowling, the required rate still only 6.6 an over. But Trego, Davies and Hildreth, the experienced heart of the top order, had fallen away in the attempt to keep the score moving. 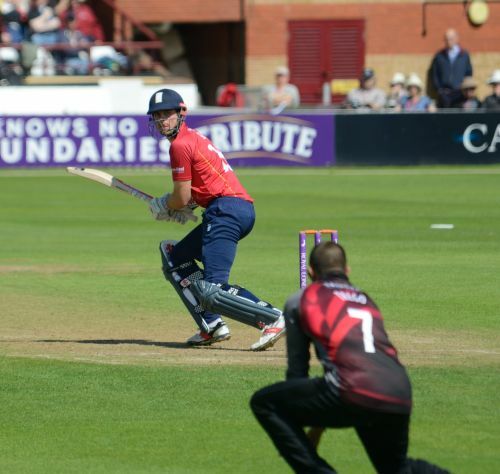 Somerset were still just in the game but the unremitting pressure from Essex was now beginning to tell. 149-4 and still 186 needed. Now Allenby, who had pushed and occasionally hit his way past 50, and Hose tried to make headway against Bopara, ten Doeschate and Zaidi. Hose in particular strained to increase the run rate but after another 10 overs they had barely managed 5 an over and the required rate was approaching 8. Still at 202-4 in the 33rd another 133 in 16 overs was a far from impossible hope in today’s one day cricket. Then, as Somerset were trying to gauge when to unleash their charge Essex unleashed the whirlwind run up of Wagner and the silky-smooth one of Harmer. 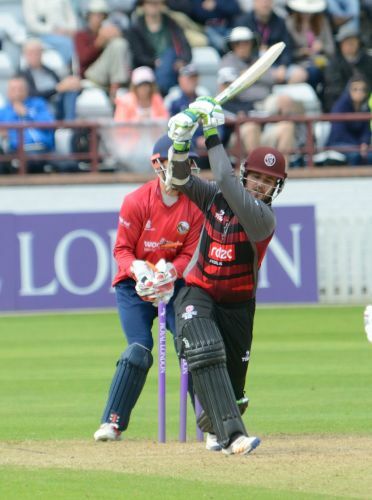 Somerset could not withstand the wind that blew then as four wickets fell in 6 overs for 28 runs and apart from a final flurry from Craig Overton and Tim Groenewald the innings subsided. 10 overs: Essex 73-1 Somerset 82-2. 20 overs: Essex 126-1 Somerset 142-3. 30 overs Essex: 182-2 Somerset 187-4. 40 overs Essex 229-4 Somerset 231-8. It was Cardiff in reverse. If Essex continue to play like this Somerset will probably have to beat them if they want to win this competition. They will have to play with the unremitting determination and application that Essex showed here and which Somerset showed at Cardiff and Bristol. Even if they do they will be met with the same from Essex and the match will go to the team that can outlast the other and which blinks last. The preparation needed will be more than hard cricket skills practice. 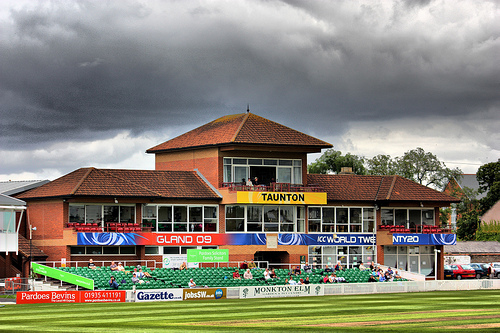 The team will need to go into the match as mentally tough as the East wind that blew across Taunton on Sunday. And a final observation. 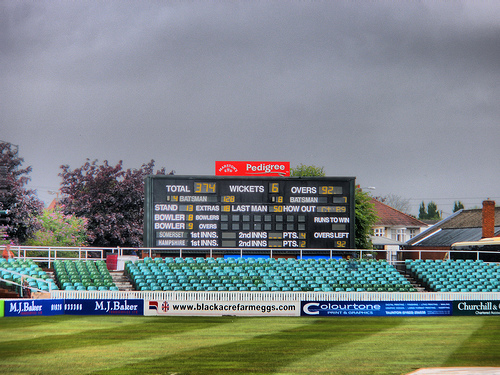 The scoreboard operated to perfection as in the Hampshire match. Dorian Gray lives. Edited 1 time(s). Last edit at 15/05/2017 22:24 by Farmer White. I think protection is exactly the right word, Old Boy, in respect of Tom Abell but whether management will have the sense to do this remains to be seen. If Second XI is irrelevant, WSM, then there is surely zero point in even sending Tom out to bat in those games!? The reality surely should be that, to have confidence in selecting Tom, management should surely need to see some sort of evidence that his form is on the turn.. as it is I'm not sure he's made it into double figures in any game at any level (including club and second XI) since the first tranche of red-ball games ended. It would obviously be embarrassing for the club to have to withdraw Tom from the firing line so soon after making him Captain but getting Tom right is, undoubtedly, far more important than sparing any managerial blushes. Looking at that list it may be a better idea to pick both Mybs and Hose rather than only one of them plus the other four. Of course there are also the form-horse youngsters, Bartlett and Byrom plus Tim Rouse has returned from uni and scored solidly too. But there's a big gap between seconds and firsts (which makes Tom's failures in the twos all the more worrying). Looking at the forecast, I've a feeling that Allenby may replace VDM and bat at 7. Cleavo - here's the difference - six games of the football season is about 15% of a Prem season or 13% of a Championship one. Six games of CC1 is more than 40% of the entire season. So there's a much more pressing need for urgent improvement over the course of 3-4 CC1 games than there is over a similar span of games in the footy. Hence form should, logically, be considered a more immediate concern early in a cricket season than a football one. 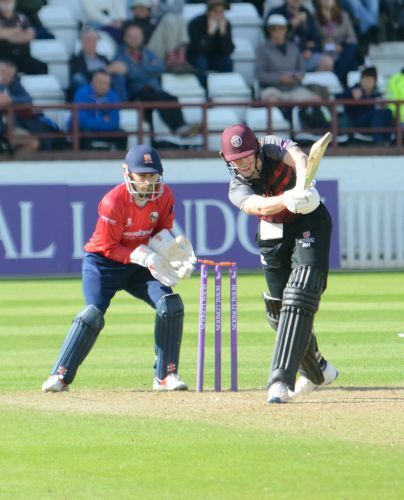 After two dire results, Somerset simply cannot afford to continue in the same vein - and the more batsmen in poor form that we select, the more likely it probably is that we will fail again. To my mind the captaincy is a red herring. Pick eleven guys and then find somebody to skipper them - if we really have nobody else in the club capable of doing the job then we really do have problems. If, as has been suggested, Tom has this technical issue, it's a huge ask to battle through this flaw and Captain the CC1 first XI. Edited 1 time(s). Last edit at 15/05/2017 22:30 by AG on apple. Its looking for an issue where there isnt one. Tom is captain, he is our future. We need to back him not make up stories after 2 games to try & cause a stir. We simply will not give up on our whole pre season plan after 2 games. As for Jim, if 2 years of averaging under 25 is what is needed yep pick him. I like Jim & yes useful but his Somersetv4 day record doesnt warrant his picking. The old adage. Pick your best eleven then choose your captain seems pertinent. Is Tom good enough to be in our top eleven? Is Steve Davies? Can we leave others out? Does Tom need time? If he does give it to him and if he comes back stronger all the better. Professional sport is rarely charitable. Hard decisions are part of the job. a spectrum of colour rather than just black and....well black. I was there as well but I didn't see what you saw because I don't come with expectations of seeing failure on a regular basis. We lost a game we could have won but your statement about the level of mediocrity across the board is simply not true. Edited 2 time(s). Last edit at 21/05/2017 12:15 by Grockle. There's a little bit more to it than just two poor first class games. No runs in the last couple of weeks in the second XI, and I think AGod said he failed to make any runs in a weekend club game. So, in fact it is a month of the season with no runs. You can't really say his 2nd XI failures don't count, as they weren't first class matches.